Kingwood Child Care & Day Care reviews, businesses and maps for Kingwood TX. Balanced Learning Curriculum prepares your child for elementary school...while enjoying a warm, loving, and safe environment in the front of Kingwood. La Petite Academy of Kingwood provides a nurturing environment where children advance their language & communication skills, creativity, intellectual curiosity, & cognitive thinking along with physical & social development. Call us today for a free tour! Kingwood Montessori School develops confident, passionate learners, immersed in a challenging academic environment, with an emphasis on peace, diversity and respect. We empower today's problem solver to be tomorrow's leaders. Since 1988, Kids In Action has been raising Kingwood’s kids. We offer Child & After School Care, Pre-school, Camp, Birthday Parties, etc. Every child is unique & we believe that success & growth come from encouragement & praise. Call today! 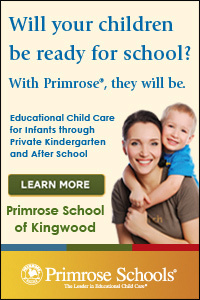 We bring a unique, Licensed, drop-in childcare solution to Kingwood & surrounding areas. Whether you are having lunch with a friend or a date night, children 6 weeks - 12 years now have a safe & entertaining place to play & explore while you are away. Our Preschool & MDO programs focuses on the development of the whole child fostering a positive self-concept & good self-esteem. Our programs offer experiences in developing tactile, visual, auditory, language & social skills in a Christian environment. 20027 W. Lake Houston Pkwy. The Leader in Educational Child Care. At Primrose, we truly believe that with the right foundation, anything is possible. We embrace every opportunity to encourage active minds, healthy bodies and happy hearts. Accredited by SACS CASI. The Academy at Rowland Ballard focuses on educating "the whole child." We unlock a child's full potential with an outstanding curriculum and exposure to the arts including ballet, gymnastics and music. Our Partnership with Parents establishes a strong connection for the benefit of nurturing and educating the children entrusted to our care. We understand how important it is for you to know about your child's day, school events and your child's progress. 25601 Thorn Hill Creek Ct.